The Wave Of Female Candidates Is Set For A Wave Of Losses, Come November A disproportionate number of women running for Congress are running in House districts that are considered pretty safe for the other party to hold, whether Republican or Democrat. 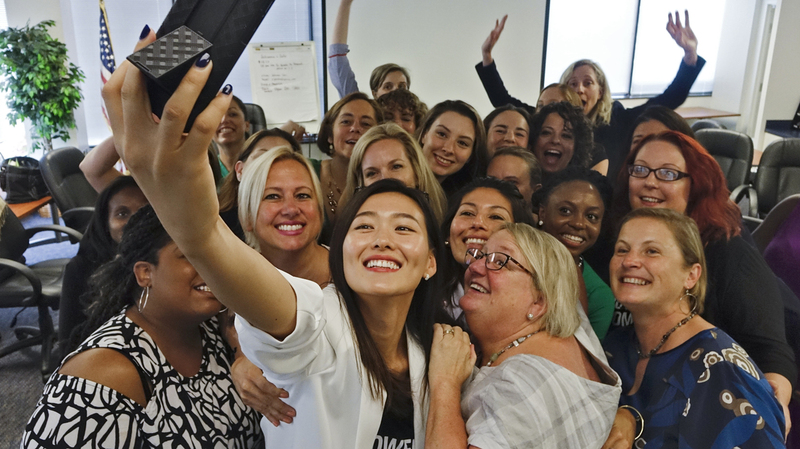 At the final session in a six-month political candidate training series called Emerge Virginia, Johanna Shin takes a group photo. Lauren Underwood is optimistic about her chances of winning a seat in Congress. "This seat is 100 percent at play. It's winnable," the Democratic candidate says of the Illinois 14th Congressional District, which stretches along the western and northern sides of Chicago's outer suburbs. Her attitude is maybe unremarkable — every candidate says they're optimistic — except for the fact that the odds are stacked against her. She knows very well that this race is considered a pretty safe bet for the GOP in November — the nonpartisan Cook Political Report lists it as a "likely Republican" win, meaning Republican incumbent Randy Hultgren has an excellent chance of holding onto his House seat. "We're not in an average year, and I'm not an average candidate," she says. "I think that that matters. What we've seen in elections out of Virginia and Texas and the special [election] in Pennsylvania is that the candidate and the quality of the election that they're running matters a lot in the election outcome." Underwood is in good company. This year's unprecedented crop of women running for office includes a glut of women running in races that, to put it mildly, will be a challenge for them to win in November. An NPR analysis shows that the influx of women candidates, beyond being heavily Democratic, features a glut of Democratic women running in races currently considered to be easy Republican wins. In total, 49 percent of the Democratic women running for the House, Senate, and governor, not including incumbents, are in "likely" or "safe" Republican races. On the other side, 34 percent of Republican women running as non-incumbents are in likely or safe Democratic House, Senate, or governors' races. And even those running for seats that are within reach for their party will still have to get through sometimes crowded primaries. The bottom line is that a wave of female candidates is going to equal a wave of women losing in 2018. Importantly, this doesn't necessarily make women unusual, according to an NPR analysis of the FEC's total candidate dataset. That data isn't perfect — it includes some candidates who filed but never made it to the ballot, for example — but it suggests that large numbers of men, particularly Democrats, have filed in districts that would be very difficult to win. Indeed, while the number of women running has increased substantially this year, the level of women as a share of all candidates has not increased all that much. Interestingly, the districts featuring female candidates followed a similar pattern in the last midterms — with many Democratic women likewise running in solid Republican districts — according to data from March 2014 provided to NPR by both the Cook Political Report and Rutgers' Center for American Women and Politics, or CAWP. Both parties have seen increases in female candidates this cycle, though far more of the increase has been among Democratic women, who have been energized by their dislike of President Trump, as well as cultural forces like the #MeToo movement. The large number of Democratic female candidates in those "solid" and "likely Republican" districts may reflect that energy, as women like Underwood hope to unseat staunch conservatives. To be clear, the candidate field will narrow considerably in the primaries. Right now, according to the Rutgers data, there are 555 women in the running for 324 U.S. House, Senate or governors' races — a figure that includes incumbents, challengers and candidates in open races. But in November, that wave of women will face its real numbers test. How many women could be elected? One way to look at the data: If a woman won every possible House race this November, women would occupy 264 House seats — well over half, and a roughly 150 percent bump from the current level of 106. But take out all of those Democratic women in races that Cook considers "solid" or "likely" Republican and Republican women in "solid" or "likely Democratic" races, and there would be a potential 162 female House members. And that's potential — assuming all of those women won. To be clear, this still gives women — particularly Democratic women — a good chance of picking up significant numbers of seats in November. Toss-up races are one opportunity for this to happen. One easily overshadowed figure in the above charts is the number of women in toss-up races this year — twice as many GOP women as in 2014, and more than five times as many Democratic women. Resisting Trump, Surge In Democratic Women Ask: How Do I Run For Office? Some women will lose, though. And that's OK with Erin Vilardi, founder and CEO of VoteRunLead, a nonpartisan group that recruits and trains women to run for office. She says her group is "coaching women to run to lose" for a few reasons. "One, you might actually win, because this is such a crazy election cycle in 2018," Vilardi says. "No political pundit knows what voter turnout is going to be. Is it going to be 16 points higher [than the last mid-term election]? Eight points higher? Five points higher? We have no idea." In addition, Vilardi says, a first-time candidate's 2018 campaign could teach them about fundraising and campaigning, not to mention giving them more name recognition, setting them up for an easier campaign in 2020. Running a strong campaign in 2018 could also get a candidate more respect and power within her party in advance of future elections, Vilardi adds. "Maybe it's also that you go to the party and say, 'If we had 12 people running in this race,' or 'If we had a ticket up and down,' or 'If we had been tending to the Latino population in this community,' or 'I registered 15,000 new Latinos as a part of this campaign' — those people are only voting for you. You're bringing that body of people with you," she says. On top of all that, Vilardi adds, new candidates can give more visibility to otherwise ignored issues. For now, Underwood has other things on her mind than the long game. She faces off against six other candidates on Tuesday (all of them men) for the Democratic nomination. She knows she's a strong candidate, having outraised all of her opponents who have filed fundraising reports combined, according to FEC data. But she does know that, if she wins, she'll have a much tougher race to run. "We're going to need to raise two million dollars in the general," she says. "This will be a challenge. We're rising to that challenge."